Positioned behind 1st Place CBS powerhouse All in the Family, Bridget Loves Bernie appeared to be a love affair audiences would favor. How could a show which finished the season in 5th Place be pawned like invaluable rubbish? Therein lies a 45-year old mystery which still has viewers pondering if this jewel was undervalued. The sitcom centered on Jewish cab driver Bernie Steinberg (David Birney) falling in love with Irish-Catholic schoolteacher Bridget Fitzgerald (Meredith Baxter). The interfaith marriage was a first on television in an era which CBS grasped to push America's envelope. Compared with crass and direct deliveries from All in the Family and its spinoff, Maude, Bridget Loves Bernie was relatively tame as the interfaith connection was the source of controversy. Rounding out the supporting cast were Audra Lindley, Bibi Osterwald, Harold J. Stone, David Doyle, Ned Glass, Bill Elliott and Robert Sampson. Religious figures cried blasphemy at what they viewed as inaccurate depictions of faith from both Roman Catholic and Judaic faiths. Several religious figures frequently met with CBS executives regarding the depictions. Boycotts were organized by a conservative Rabbi, and several reformed Rabbis met with CBS to plead for the show's cancellation. Threats against the studio and its stars ensued, as well as telephone threats to the home of producer Ralph Riskin. The controversy, coupled with the fact that the show's 24.2 ratings average retained a meager 76% of lead-in All In the Family's 31.2 rating that season, may have been the culprit for cancellation. 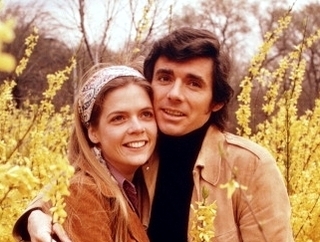 A bitter ending of a sweetly conceived show resulted in a life changer for Baxter and Birney, who eventually married in 1974 and shared 3 children during their 16-year marriage. Birney went on to enjoy a single-season run on St. Elsewhere from 1982-83, while Baxter became a household name as she moonlighted on NBC's Family Ties as Elyse Keaton.